Mohammed Nazimuddin Ahmed was born October 1, 1985. He is a Bangladeshi cricketer who started his maiden first class season aged just 16. He plays first class cricket for Chittagong Division and is a right-handed batsman. Nazimuddin has also played for Bangladesh A and Bangladesh Under-19s. He was called for joining Bangladesh national cricket team to take part at the inaugural ICC World Twenty20. He was also selected to the Bangladesh national squad tour to Australia in August/September 2008. However, he broke his finger in the warmup to the matches and could not participate. He proved it in a Twenty20 international against Pakistan, smashing 81. However, he struggled with his consistency in the one-dayers and after just seven games, risked his career by joining the Bangladesh exodus to the ICL. Find Nazimuddin profile and stats of batting, bowling and fielding including latest updated news of Nazimuddin, videos and images at Hamariweb.com. 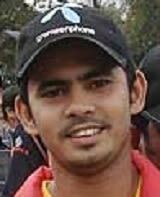 Also find detail Player profile and career statistics of Nazimuddin of Bangladesh. Nazimuddin - Find Nazimuddin of Bangladesh Cricket Team complete player profile, number of matches, runs score, wickets & catches, Statistics, Records, Nazimuddin Latest News, Nazimuddin Videos, Nazimuddin Photos, and other Nazimuddin Cricket Team players.